Here is another slideshow of our big day! More pictures of Lauren's bday, our anniversary cake, and more! Enjoy! Micah's is officially a 2nd Lt./"Chaplain Candidate" in the U.S. Army. We took the Megabus to MN where Micah's parents picked us up and drove us home for breakfast. We napped, Micah got a military haircut and had Lauren's bi-annual ring inspection done at the Jeweler's. We met Lauren's parents and Micah's family at the Armory on the University of Minnesota campus. Micah's friends from his trip Israel, Ken and Barb, also came to see him take his oath of office. Major Boisen administered the oath and Micah signed the dotted line. He's technically a 2nd Lt. but it will be official when he gets his orders in a few weeks. After the oath, we all drove back to the McLellan house for lunch. The grandparents, Aunt Sue, baby Madeleine, and our friends Jon and Katie all came to celebrate too! Besides Micah's oath, they were there to celebrate Lauren's birthday, our 1st anniversary, and Ariel's birthday. 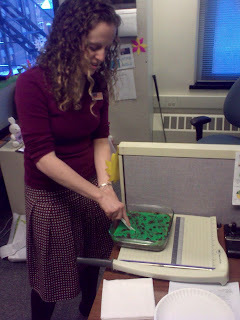 Our cake topper had been frozen all year, so it was thawed and we all ate it - it still tasted great! That evening we got right back on the bus for home - we needed Sunday to recover from missing sleep on the bus. We had a great day in MN and loved seeing our dear family and friends. Tomorrow morning I (Micah) will be sworn-in as a 2LT, Army Chaplain Candidate at the Armory of the University of Minnesota. 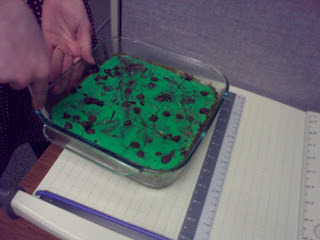 Yesterday, my boss and several of my friends (and co-workers) threw a mini-party :) Brittney made some sweet camo-brownies, using Christina's mom's recipe! GOOD stuff! Melissa also provided some sweet USA stickers for the event :) Thanks guys for the fun afternoon and celebration! Lauren and I are excited to be going home - even if it's only for 12 hours! Micah taking Lauren out on a date! Micah's friend Tim (from his Israel team) came to visit us on December 19th, on his way to Arizona! We had a Christmas party at our place on the 13th of December (there are a couple great videos too)! And last but not least, Micah's Christmas party at his job at Moody! Just two days ago Micah received his "Oath of Office" form!! This was the last piece of material we have been waiting for in order to be sworn in. (Apparently Congress had to approve him after the Army Board so that was why we have been waiting these past few months). Now we are making tentative plans to go to Minnesota next weekend for his swearing-in ceremony at the Armory located at the University of Minnesota. From that point he will be considered a 2L (2nd Lieutenant, and should receive his first orders and his assigned unit within two weeks of taking his oath. God has been faithful to us and this ministry opportunity may open many more doors to serve our Savior through the opportunities that the Army can offer. Please keep Micah in your prayers as he is currently overwhelmed with homework (more than last semester) and is doing his very best to stay on top of things. Please also pray for Lauren, as she continues to work full time at Little Green Tree House. She has been loving her job and has loved taking care of the infants in her room. The infants are adorable and the parents are incredibly caring individuals. Please pray that God continues to give Lauren the rest and energy needed in order to most effectively nurture and care for "her" infants on a daily basis (as she has been doing so well)! Pray also that both both of us continue to seek after God's own heart, and that our lives continue to be transformed into the character of our Messiah. ps. We were also both blessed to spend time at Moody on Thursday evening for a Valentine's dinner sponsored by the Student Wives Fellowship. We got all dressed up, hung out with some friends of ours, listened to a good speaker (a couple actually), and ate a lot of good food!! This week was fun but busy! Work and school went smoothly. Lauren's parents and sister flew to visit us on Thursday morning! They went with Micah to visit Lauren on her lunch break. They had lunch together and then all went to Lauren's work to see the babies. They stuck around to play with the babies for a while and headed to Moody for "Founder's Week." 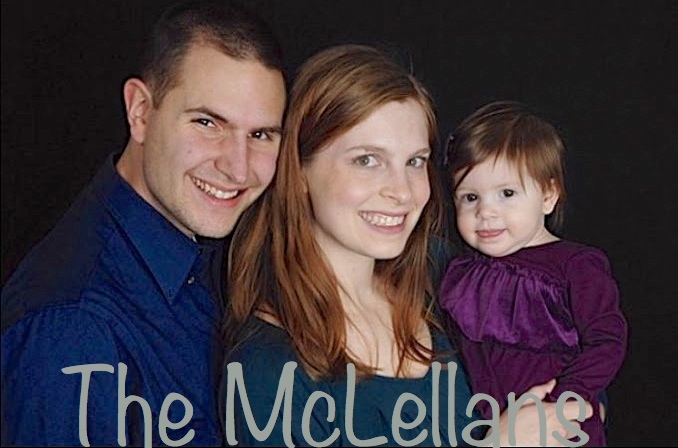 There they listened to one of Micah's professors, Walt McCord, speak. That evening they all went to the Art Institute of Chicago. The institute was HUGE and had amazing artwork to see. Lots of famous paintings were there that we'd only seen in books - a very cool experience. The institute has a large collection of Monet and Renoir, famous American artwork, and some amazing ancient Greek, Roman, and Egyptian art. (Lauren is a big fan of the board game "Masterpiece" and got very excited every time she saw a painting from the game.) The month of February is free admission, so we may go back to see more. We probably saw only a fifth of everything there! After all that art, we went to a pizza place in south Chicago - Homerun Inn - delicious stuff! Friday was a laid back day - everyone made dinner together and headed to Moody to see a "Founder's Week" speaker - Dr. David Jeremiah. He had a powerful message to tell. We later walked to Portillo's for Chicago hot dogs and "chocolate cake shakes." If you haven't had a chocolate cake shake in Chicago, you are missing out! Saturday we all walked around the Wrigleyville neighborhood checking out a few shops. We visited at the apartment for a while and watched the film "Radio." In the early evening, Micah and Lauren had to say goodbye already. We drove Erick, Cindy, and Danielle to the airport and they flew safely home. On Sunday we went to Church and to a church meeting (there was Jimmy John's for lunch - we won't say no to church meetings from now on :) ). We learned a lot about the church, it's past, and it's goals for the future. God has blessed us with an awesome church to attend and we hope to get more involved soon. Membership classes are coming up and we want to begin the membership process. In the afternoon we lounged around and half-heartily watched the super bowl.